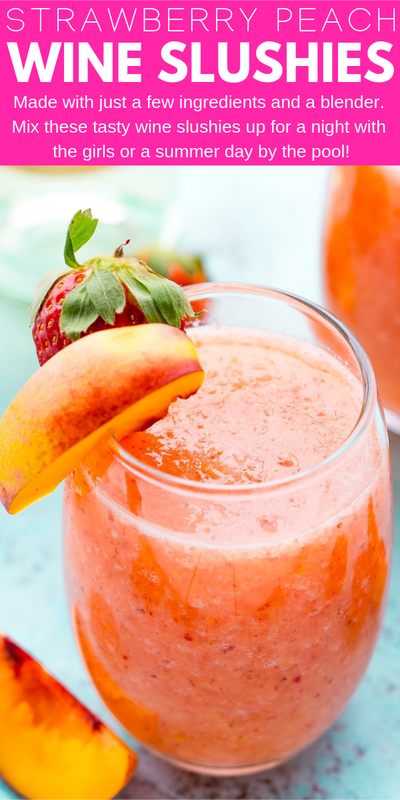 Strawberry Peach Wine Slushies are made with just a few ingredients and a blender. Mix them up for a night with the girls or a summer day by the pool! Guys, it’s been beautiful here in Maine the last few days and I’m actually feeling hopeful that we’ve seen the last of the snow and summer is surely on its way. We’ve also spent the last few days moving and the nice weather helped soften that task. 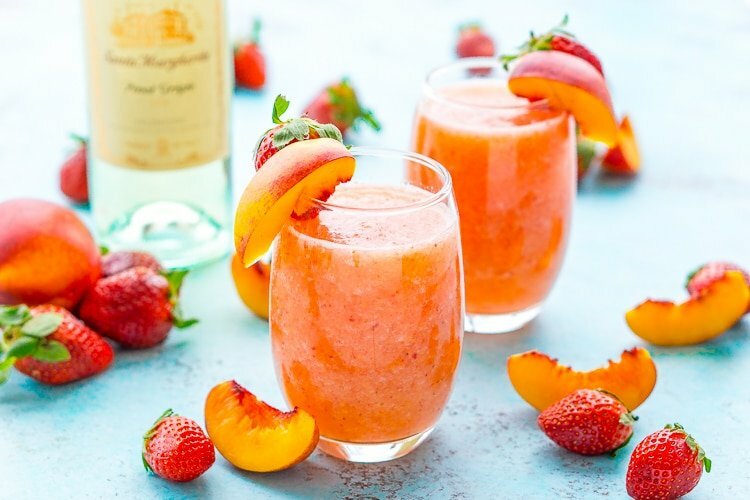 But today, I’m bloody exhausted, so I’ll just be over here sipping on these Strawberry Peach Wine Slushies. Wanna join me? Bring these Donut Floaties and I’ll meet you at the pool! You’re going to love how easy this fun cocktail is to make, with just a few ingredients and a blender you can be slurping these babies out of stemless wine glasses in no time! You can also make this recipe sweetened or unsweetened depending on your tastes. 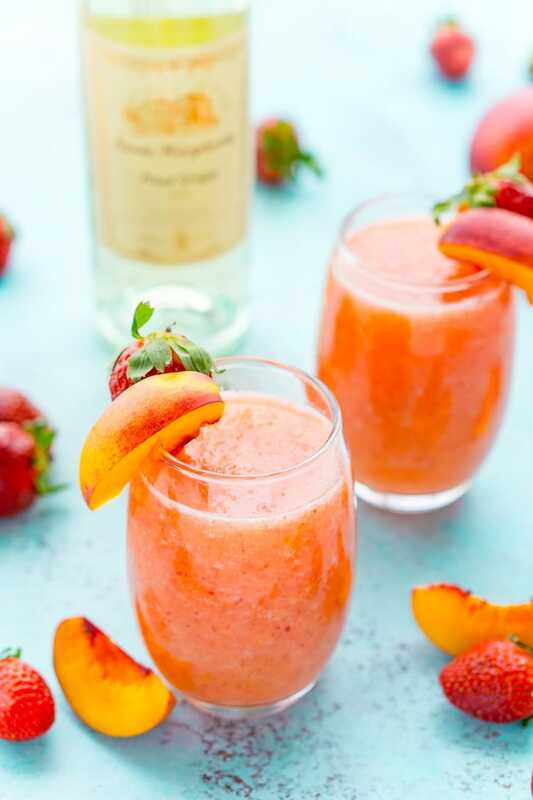 Either way, you’re going to love the way the sweet strawberries and ripe peaches come together with white wine for a delicious and refreshing summer cocktail. Raspberries make a great substitute for the strawberries too! And if you want a slushie that’s got ALL the berries in it, try my Sangria Slushie! I’m totally digging the alcoholic “slushies” trend right now. I loved Slush Puppies as a kid and these remind me of those, just even better because they’re made with real fruit and booze! Yes, please! 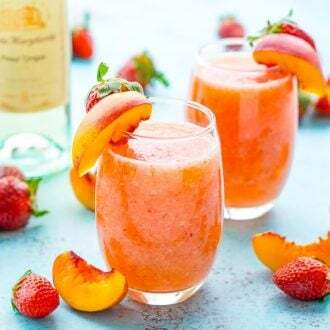 These delicious Wine Slushies are definitely going to help to get me through the next week while we finish moving and I work before taking off on vacation next week, and hopefully, by the time I get back, summer will be well on its way! 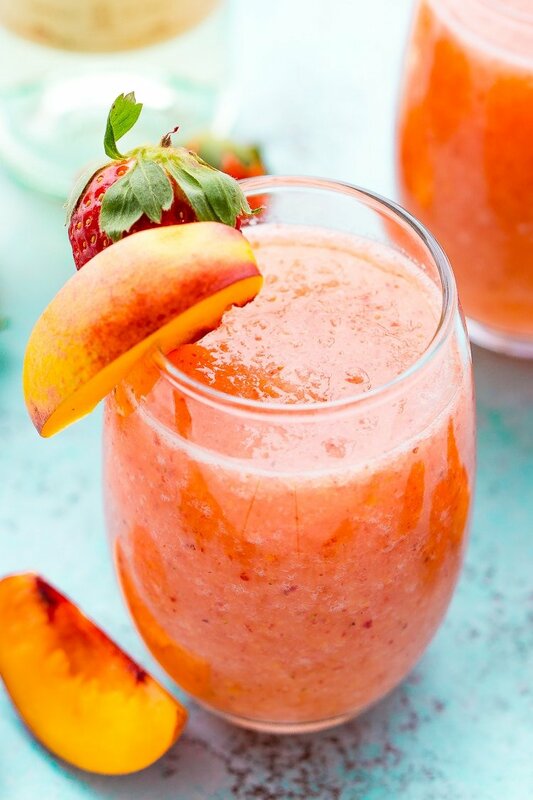 Add fruit, ice, and wine to a blender and blend until slush forms. Add a straw and enjoy! Low Calorie! This recipe makes about 4 servings and each serving only has 157 calories! These means they’re a great drink when you’re trying to be “good”! Frozen Fruit! 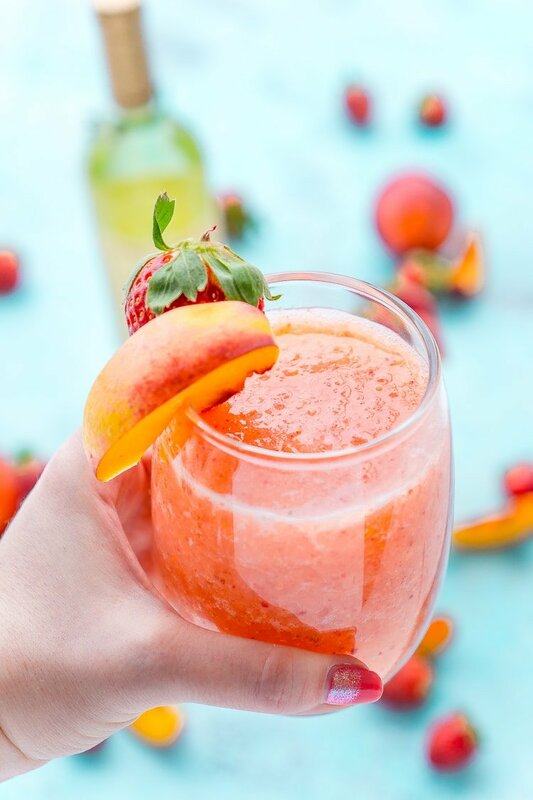 By using frozen fruit, not only are we maintaining the nutrients that fruit has to offer (and quickly balancing it out with wine) but it means that you can buy the ingredients well in advance and there’s really no prep time. No need to rinse and dice before adding to the blender! Easy! Since the recipe only has 4 ingredients and some ice that gets tossed into a blender, this cocktail comes together super quick and with hardly any work at all! What Wine Do I Use For Wine Slushies? For this recipe, the fruits are best matched with a white or rose wine, not red. You can use whatever wine you desire from a Pino Grigio to a Moscato. Personally, I prefer it with Riesling or a Pink Moscato. 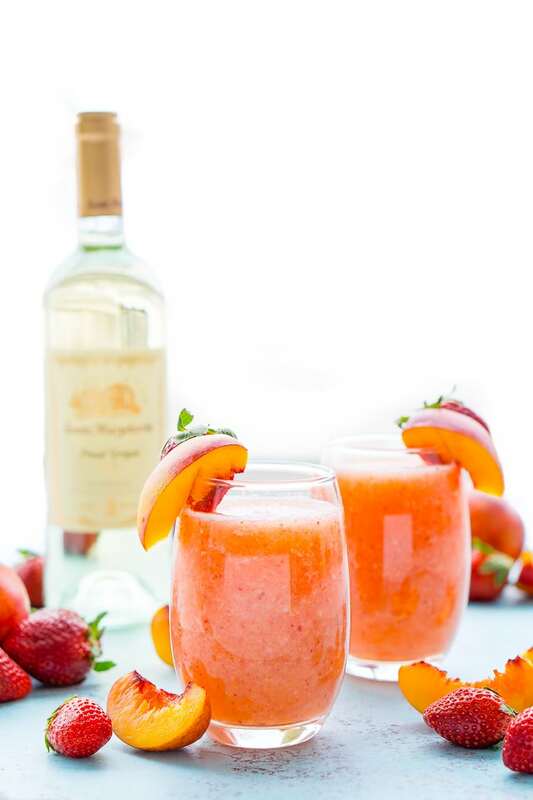 How will you enjoy these delicious wine slushies? They’re great for girl’s nights, barbecues, bridal showers, and so much more! And who doesn’t love a super fun and delicious cocktail! Add all ingredients into a blender and blend until slush forms. Pour into glasses and serve with fruit slices for garnish. Simple syrup can be left out if desired. OMG!!! I Just made this with Pino Grigio and it tastes sooo good!!!! You can’t even taste the wine so if you don’t like wine this is a great recipe to try!!! Would love to try more of your recipes. Hi Barbarah, I’m so glad you enjoyed it, I bet you’ll love my Sangria Slushies too! instead of using wine can it be replaced with pineapple juice or Sprite or 7up? Hi Alice, a popular non-alcoholic option for this recipe has been white grape juice. I have never made it this way myself, but several readers have and loved it!